Have you ever found yourself irritated by other team members because they do not do things your way? Have you ever found yourself irritated by other team members because they do not do things your way? Does someone resist change and refuse to think about your ideas? Or annoy you because they make decisions slowly when you want to get on to the next task? According to the Myers Briggs personality measuring tool, these are personality preferences. The Myers Briggs questionnaire prompts the participant to identify their behaviour from one of 16 different types, using a combination of letters. It offers personality type as a starting point from which you may gain an idea of how others see you. 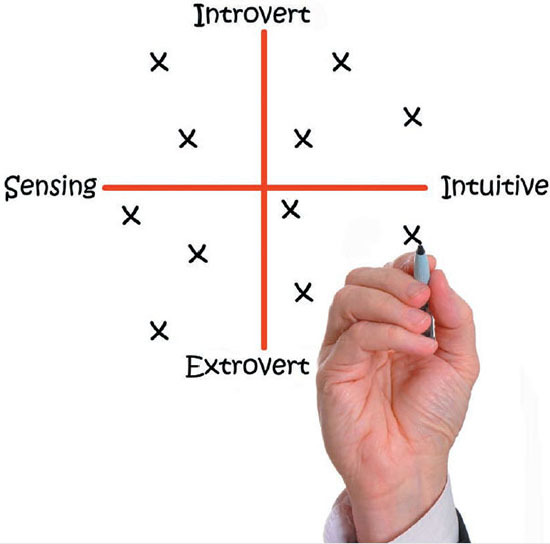 Some of the key aspects of Myers Briggs preferences, and how these might translate into work behaviours, are shown below. No way is better or worse than another; a good team needs all personality types. People who gain energy from being with other people tend to use their Extraversion (E) preference. If you prefer to use your energy on the inner world of thoughts, information and ideas, then your preference is for Introversion (I). People who are E tend to bounce ideas off other people and think that everyone needs to talk about their problems. They may be too busy talking to listen. People who are I may need time to think about new ideas and processes, so they should be given a chance to think about things before an opinion or response is expected. They may be good listeners. If you like to deal with facts, then you probably use the Sensing (S) preference. If you think in terms of concepts and ideas and like to change things, then you are using the iNtuition (N) preference. S likes using tried and tested approaches, while N likes to change and innovate. Both preferences are healthy in a team. Thinking (T) preferences like clarity, choosing to step outside a situation to make a rational decision irrespective of what people may think. Feeling (F) preferences prefer harmony over clarity and will consider other people’s feelings before making decisions. T may need to think before they speak and potentially hurt others’ feelings. F may need to learn not to take things personally and realise that disagreement can be healthy if it results in positive change or improvement. Judging (J) preferences like to plan, compile lists and be organised, making decisions quickly and moving on to the next task. Perception (P) preferences are flexible and spontaneous; they often leave tasks until the last minute, as they like to consider a range of possibilities before making decisions. J may decide too soon and P may be viewed as procrastinating, seeing at least two sides to every issue. A blend of both approaches is good. P may feel stressed at the last minute if they have agreed to take on too much, and J may feel stressed when first asked to do a task, until they get organised. This brief overview may help you to recognise the strengths and limitations of some of your behaviours. As humans we are complex and should not be stereotyped, but we can use this tool as a starting point to improve our working lives.